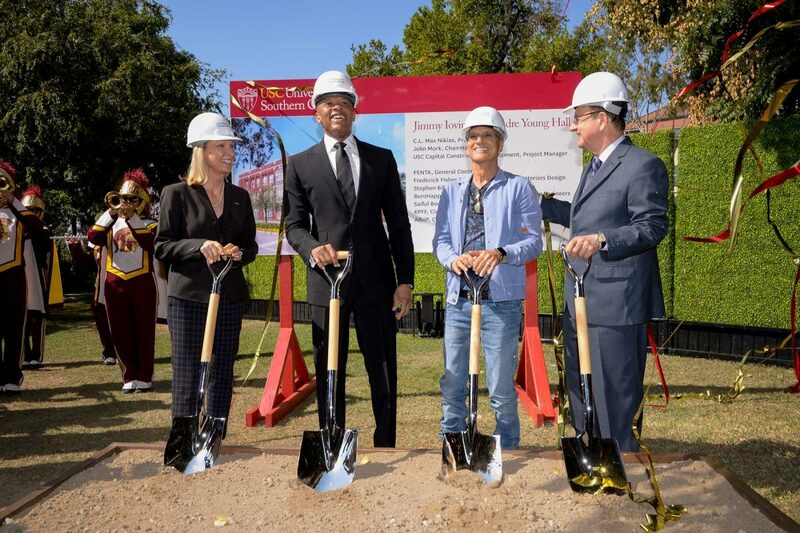 Apple employees Jimmy Iovine and Dr. Dre this week broke ground on The Jimmy Iovine and Andre Young Academy for Arts, Technology and the Business of Innovation, a new academy named after the two men opening at the University of Southern California in 2019 (via USC News). The academy will focus on four areas of study: art and design; engineering and computer science; business and venture management; and communication. The origins of the academy date back to 2013, when Iovine and Dr. Dre donated $70 million to help create the 10,000 square foot academy. Although the first building won't open for another two years -- called the "Jimmy Iovine and Andre Young Hall" -- some of the academy's programs and classes are being run within other USC buildings. In total, 114 students are already taking part in Iovine's and Dr. Dre's new program, and are set to graduate next May. “It will stoke the fire of students’ imaginations, and it will propel the next generations of inventions and products that will transform our lives,” USC President C. L. Max Nikias said at the groundbreaking ceremony. “I hope at this school we can help our students to dream big, execute and build the courage to stay in the saddle,” Iovine said Wednesday. One of the academy's programs includes an annual pitch competition where students have the opportunity to win $10,000 to help grow an original idea, and a few enrolled in its programs have recently received internships at Facebook, Hulu, Sony, and Oculus. To get into the academy, students described "the most intense application process," where they first submit a portfolio and video of their own idea or business proposal, and then sit down for an interview with a panel of 10 people. In a profile by The Wall Street Journal in 2014, Iovine explained that the academy was built to prepare students to "speak both languages" of technology and liberal arts. The Apple Music executive also said that one of the goals of backing the academy is to "find kids who can work at Beats or at Apple." It's interesting that USC won't take money from Harvey Weinstein but they will take money from Dr. Dre. Cause hes a doctor fool. I'm still trying to figure out the field of Dre's doctorate. Money really does change everything. More like time. I mean how many of us are the same people we were 20 years ago? 10 years ago? Heck, same as we were last week? People change. Dr. Dre with a university academy and Donald Trump President of the USA. Who's the lady in jeans and the baby blue sport coat on the right? Next to the Dr.